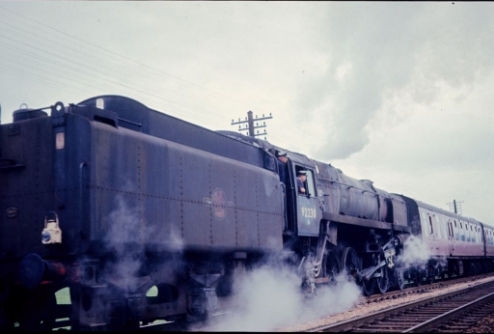 This page contains ten photographs of BR Standard class locomotives at work in the county in the early 1960s. 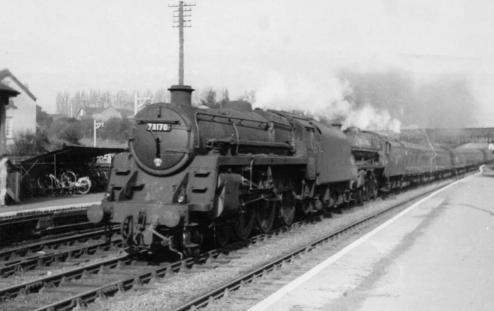 The first three are class 5 4-6-0 mixed traffic locomotives and the other seven are BR Standard class 9F 2-10-0 locomotives in Bromsgrove and Barnt Green. This is the first of three similar Standard class 5 4-6-0 steam locomotives on this page and this is perhaps the most intriguing as it shows No.73043 of Canklow shed at Evesham on 24th May 1961. Notice the well-filled sidings in the background containing a mixture of coal trucks and covered vans. No.73068 of Bristol (Barrow Road) shed looks to be in fine condition as it drifts off the Lickey Incline and into Bromsgrove Station with a semi-fast train from Birmingham. Standard class 5 No.73170 of Leeds (Holbeck) shed is piloting ex-LMSR 'Jubilee' class 4-6-0 No.45569 "Tasmania", also of Leeds Holbeck. 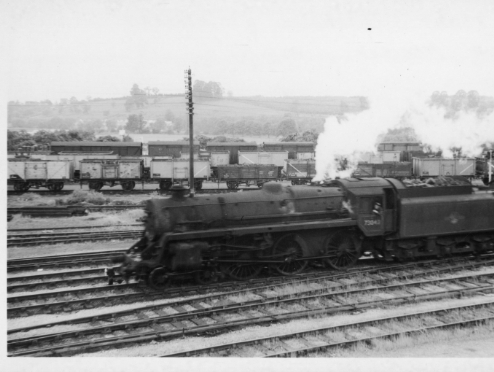 This photograph was taken on 4th March 1961, and within a few months of the taking of this photograph most of these heavy long-distance passenger trains would be in the hands of "Peak" class diesel locomotives. 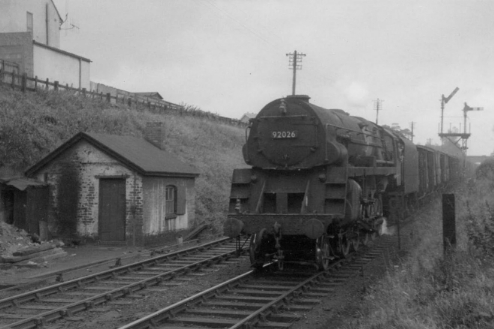 The Crosti boilered class 9F 2-10-0s could often be seen in Worcestershire as in this view of No.92026 at Bromsgrove on 5th October 1963. No.92079 of Bromsgrove shed in typical action as it banks another train up the Lickey Incline. 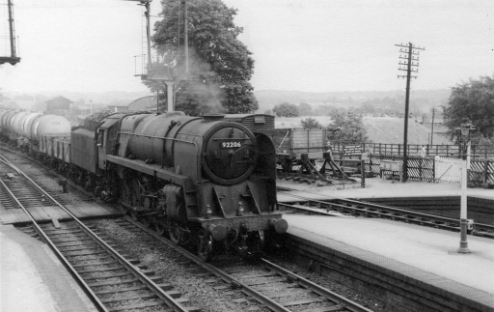 It is seen passing through Bromsgrove Station on 5th October 1963. No.92104 of Leicester (Midland) shed has steam to spare as it prepares to ascend the Lickey Incline. 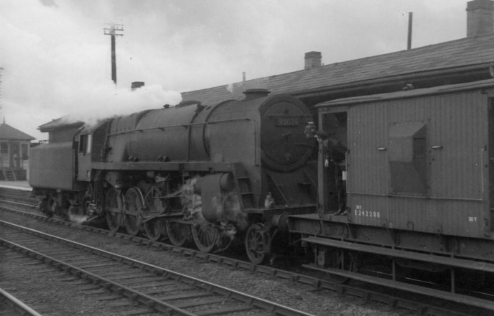 It was photographed at Bromsgrove on 18th August 1963. No.92107 also of Leicester (Midland) shed has steam to spare as it prepares to descend the Lickey Incline. 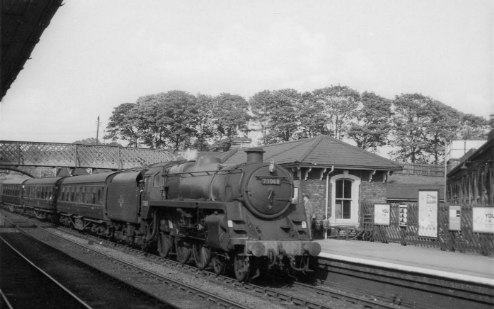 It was photographed at Barnt Green on 18th August 1963. 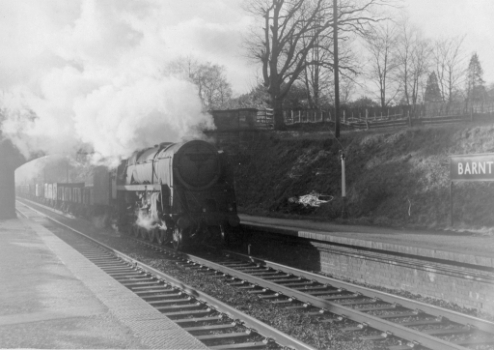 The crew of No.92139 of Saltley shed are no doubt relieved that the climb of the Lickey Hills has been completed as they head through Barnt Green Station on the way to Birmingham on 13th January 1962. No.92206 of Eastleigh shed has charge of a train of oil tankers at Barnt Green. The lines behind the locomotive go to Redditch. The photograph was taken on 20th August 1962. 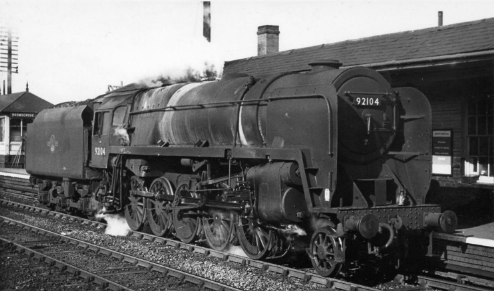 Bromsgrove's large locomotive towards the end of the use of steam banking locomotives at Bromsgrove was No.92230. 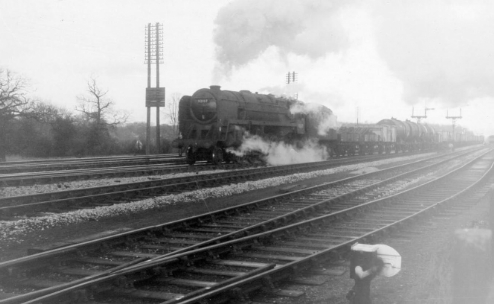 On 14th June 1964 it is seen in its familiar position, at the rear of a northbound train. No.92230 was banking No.34079 on a Bristol to Crewe Railtour (Warwickshire Railway Society).